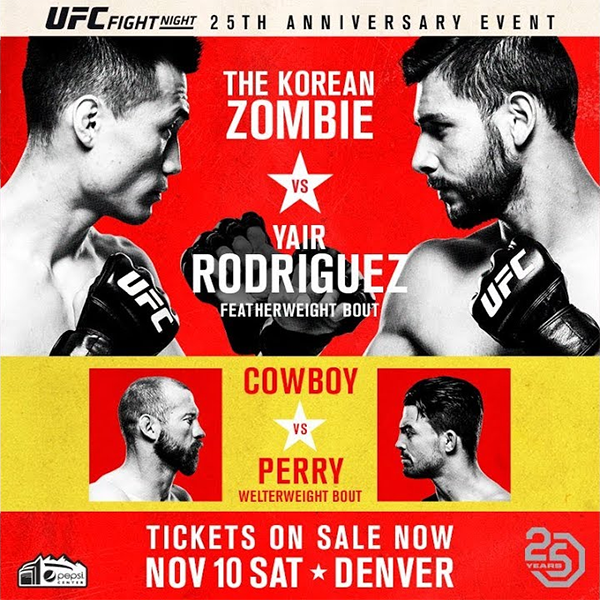 UFC Fight Night 139: Korean Zombie vs. Rodríguez mixed martial arts event produced by the Ultimate Fighting Championship will be held on November 10, 2018 at Pepsi Center in Denver, Colorado, United States. The UFC will celebrate its 25th Anniversary at this event, given its first event took place on November 12, 1993. This event will also take place in the same city as the inaugural show. A featherweight bout between former UFC Lightweight Champion Frankie Edgar and former UFC Featherweight Championship challenger Chan Sung Jung was expected to serve as the event headliner. However on October 26, it was reported that Edgar pulled out due to injury and replaced by The Ultimate Fighter: Latin America featherweight winner Yair Rodríguez. Ricardo Ramos was expected to face Ricky Simon at the event. However on October 15, it was reported that Ramos pulled out due to a hand injury, and in turn, Simon was removed from the card as well. 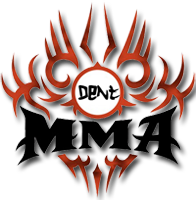 A lightweight bout between Beneil Dariush and Chris Gruetzemacher was expected to take place at the event. However on October 18, it was reported Gruetzemacher withdrew from the event due to undisclosed reasons and was replaced by promotional newcomer Thiago Moises. A women's strawweight bout between Maycee Barber and Maia Stevenson was expected to take place at the event. However on October 20, it was reported that Stevenson pulled out from the event due to injury and was replaced by promotional newcomer Hannah Cifers. A light heavyweight bout between Alonzo Menifield and Saparbek Safarov was expected to take place at the event. However it was reported on October 21, that Safarov pulled out from the event for undisclosed reasons and the bout was scrapped. Menifield will be rescheduled for another event. Jordan Espinosa was expected to face Mark de la Rosa at the event. However, on November 4, 2018 it was reported Espinosa pulled out from the event and he was replaced by Joby Sanchez. Ray Borg was expected to face Joseph Benavidez at the event. Borg pulled out on November 7 due to medical issues and the bout was cancelled. Happy 25 years UFC, with a bang!! Latest knockout in UFC History. So happy for Cowboy getting that win! What a guy! Hope he goes back to 155 and can make another run for the belt against some fresh opponents. Main event was great too, thought it was closer than what the experts were saying but spectacular finish from Yair!